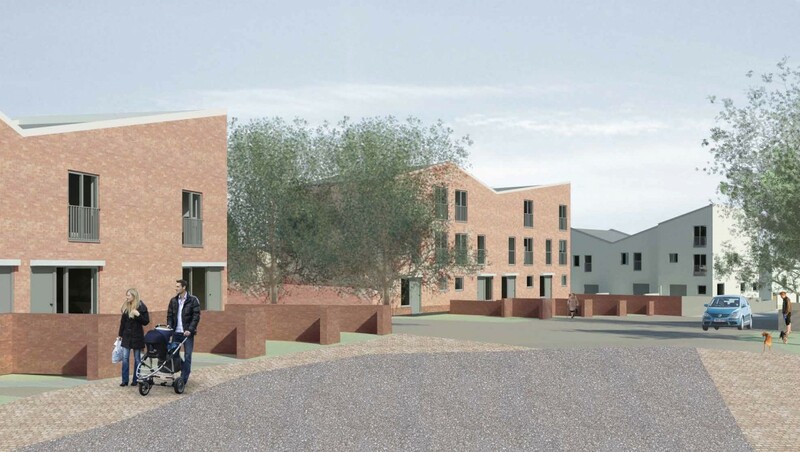 A £26m development of 189 affordable homes centred on Fraser Avenue, Inverkeithing, has secured planning permission in principle – including the demolition of 236 existing properties. 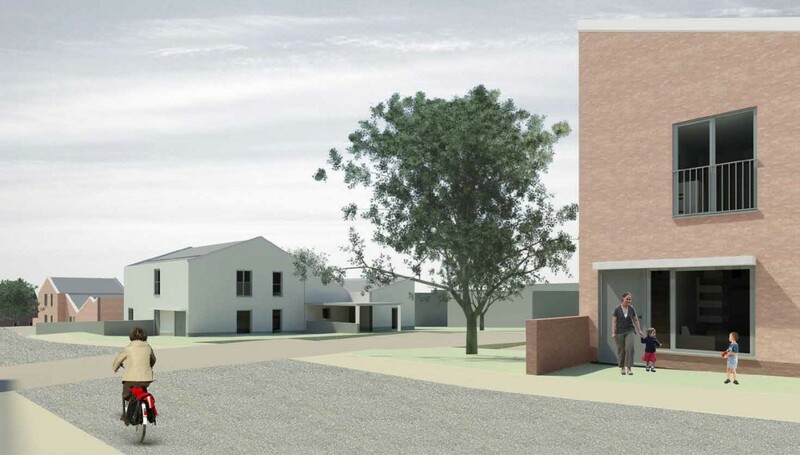 Drawn up by 7N Architects on behalf of Kingdom Housing Association the scheme will include shops, a village green and play park whilst improving pedestrian connectivity through the area. Taking their cue from existing homes in the estate 7N said: “At Spencerfield, to the east of the site, the predominant building type is two storey terraced housing that is clad in a light grey harling. 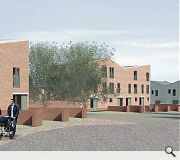 The new housing at Fraser Avenue seeks to utilise this terraced typology and improve on it. Site clearance is expected to get underway from September with phased completion expected through to 2021. Surprised this is a Kingdom Housing scheme, it has potential. I'm a fan of the roofscape, although not sure the shallow pitches are suitable in this context - hopefully they can pull off those valley gutters! The street and landscape needs a lot of work. Wonky angled roofs tae add some je ne say qwa becoz thu architetcure doesnae dae that on its ane merit. And the hooses are evun marketed by this roof feature -- Saw tooth inverkeithing. The acshul roof feeture is wit is thu main architectural feature ae this project. Wit about the the parts ae the building which ashully interact wae these hings cawwed human beings? who is this designed fur -- the seagulls? I do not support this. It's yet mare tripe fae the lefty indoctrinated architectural communty being passed aff as architecture. It isnae. Compare this tae whit wiz being built in the past -- stone built, humble architecture that weathers wae grace. But wiz ripped doon by our concrete modernist masters. Not fur me. It's not good enuf. I get 3 points! Whoop. You have to query why a housing association is agreeing to move forward with an expensive, high maintenance roof solution involving parapets and internal valley gutters. Not to mention, in this day and age with pressing affordable requirement, the reduction in site density. Those valley gutters will be a nightmare once the seagulls take residence. Suburbia needs a serious overhaul if it's to be viewed as a viable means of providing housing (not that that is stopping politicians, planners or developers from promoting it). Giving a scheme a fancy contemporary roof form isn't enough, it's probably not even a thing. Fundamentally it's an unsustainable and anti-social method of providing housing. How does the design of this development address issues of public transport, dormitory zoning/monoculture, urban sprawl, community creation and the sustainability of such? In fairness, these aren't issues the architect would have had much opportunity to address here. 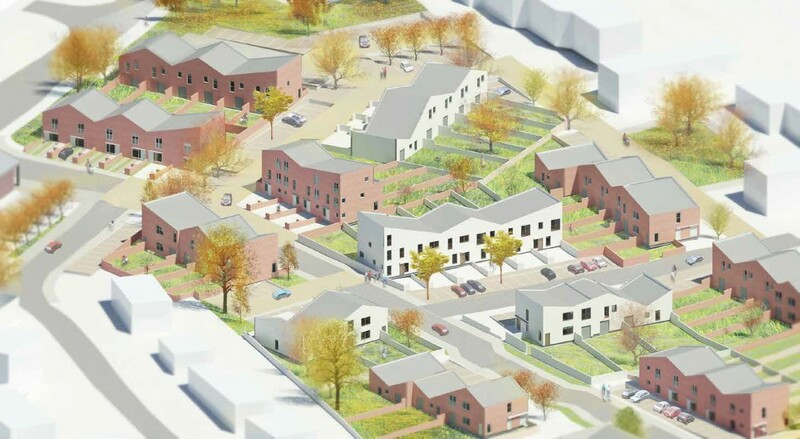 Im not sure if you realise that this scheme is brownfield, sits within easy walking distance of Inverkeithing town centre and train station and will contain new shops as well as a mix of sizes of affordable housing? Its also retaining the old community within the same area. 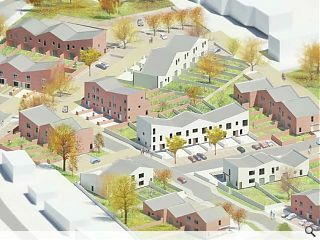 The consultation undertaken with the existing community there expressed a desire for lowering the massing and scale of the housing from what is there at present. Suburbia has its place in certain circumstances. Inverkeithing is obviously a suburb with only one supermarket (Farmfoods) and not many shops, so for any choice (or most employment opportunities) a longer journey is required. It's half a mile (or more depending on where in the development you choose to measure from) to either High St or station, which is (rightly or wrongly) more than most people will walk unless pressed. It's not a very sustainable town but I accept that doesn't mean it shouldn't have investment, and in these circumstances (replacing poor quality stock) there may have been little choice but to maintain the poor planning decisions of previous councils. In future though, especially where affordable housing is concerned (to house the most vulnerable, who shouldn't have to rely on cars), couldn't we consolidate our bigger urban centres instead? As I said, it's unfair to blame the architect in this instance but I think it represents poor planning. Well taking the centre point of Fraser Avenue and measuring walking distance using Bing Maps, its an 8 minute walk to the train station which give access to the East Coast Mainline, providing links to Edinburgh every 5 minutes and central Kirkcaldy and Dunfermline every half hour. Its 10 minutes to the centre of the High Street which contains pubs, takeaways, local shops and main bus services. You have major employment sites within 1-3 miles of the site at Bellesknowe, Hillend - Dalgety Bay, Rosyth and South Dunfermline - Pitreavie, Carnegie BP and Masterton. You have major shopping services 4 miles away in Dunfermline, easily accessible by train (less than 15 mins) and bus or central Edinburgh the Regional Centre for the area within 20 minutes journey time. You have the Fife Coastal path just to the south of the site providing active travel access to 117 miles of coast line. Add to this the fact this is replacing redundant poor quality 1950's council stock with modern housing on a brownfield site. Frankly I think it's a very sustainable location. But at least this location has a choice of modes of transport for those who don't have access to a car. You cant say that about most "suburbs". I think 'very sustainable' is probably stretching it. Granted it's not the worst suburban sprawl but bus and train services to Inverkeithing aren't exactly on a par with Glasgow or Edinburgh. Half hourly trains to Edinburgh, with the last just after 11pm. Not exactly brilliant. The route you cite to Dunfermline is only every half hour as well. The services are just about the bare minimum to make life workable but not what most people would aspire to (not without a car anyway), so why are we putting our social housing here? You seem very well informed on the scheme so perhaps you know? A cynic might say that councils can build on cheaper land out there than in the larger urban conurbations and that it's less contentious to provide social housing away out there than elsewhere. You only need to read the submissions in the planning application to see the merits of the scheme. I also know the area. Inverkeithing is a long-established settlement dating back to Medieval times. Its a smaller settlement sitting on the fringe of the greater Dunfermline conurbation. It has a traditional high street with its own local facilities. The train station is one of the busiest on the East Coast Main line with express and local Fife Circle trains all stopping there. You can even catch the Aberdeen to London train from it and trains to Edinburgh are actually almost every 10 minutes. One of the busiest park and rides in Scotland is nearby at Ferrytoll. There is a lot of potential at Inverkeithing if you see it in the context of greater Edinburgh. It isn't possible to put all housing in locations like central Edinburgh or Glasgow without comprehensive redevelopment which I can't imagine there is a political appetite for. 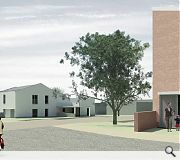 This development is replacing a social housing area, within the control of the local authority, with a new one. The Council own most of the land so they have leverage. There's an acute demand for affordable housing in the area. I think you'd be challenged to find areas like this that have better access to public transport and services within easy reach. The Dundee waterfront might be the only exception.